These rugged Toyota's provide the dependability and versatility you need from your large-capacity cushion tyre forklifts. 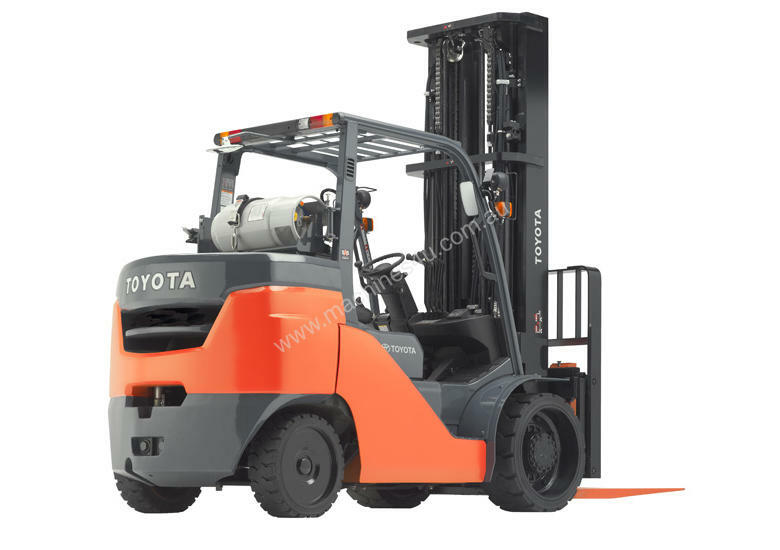 They also offer the well-thought-out operability and serviceability features customers look to Toyota for, making these lift trucks ideal for your heavy-duty applications. High-torque 4.3 litre/ V-6 overhead valve gas engine delivers exceptional load handling and smooth acceleration. Centralised Hydraulic Power System (CHPS) controls tilt, lift, attachment, steering and braking functions. Advanced ergonomics, steering control & load handling capabilities. Excellent maneuverability and a tight turning radius. Optional high mount rear combination lights are integrated into the overhead guard, making stops and turns highly visible in the workplace. Optional EZ Pedal enables an operator to quickly change travel direction without taking a hand off the steering wheel or hydraulic controls. Other features include an integrated headlight and turn signal switch to enhance operability and an exclusive memory tilt steering wheel that provides optimum comfort. Integrated monitoring system includes hourmeter; water temperature and fuel level gauges; clogged air cleaner, oil pressure and charge warning lights. Toyota's swing-down LP tank bracket enables the operator to use a proper lifting motion in the safest and most ergonomically efficient manner..